Martin Sheen aboard Sea Shepherd research vessel R/V Martin Sheen. The Golden Globe, Emmy and Screen Actors Guild awardee expressed to the Prime Minister his grave concern that Denmark, a member nation of the European Union (EU) – subject to EU laws prohibiting the slaughter of cetaceans – is not only supporting but actively protecting the grind, which claims the lives of hundreds of pilot whales and dolphins each year. The Royal Danish Navy has assisted Faroese authorities in the arrests of Sea Shepherd volunteers peacefully attempting to protect the pilot whales from slaughter. Shocking images and footage of the slaughter as well as the arrests of five Sea Shepherd crew on July 23 and two other crew on July 20, for whom sentencing is pending, have sparked worldwide calls for Denmark to halt its support of the bloodshed. Yesterday, another five Sea Shepherd volunteers were arrested for attempting to interfere in a grind that was called, where 61 pilot whales were herded onto a beach in Sandvagur and slaughtered. Despite claims from Faroese whalers, the grind brings a slow, painful and terrifying death to these highly intelligent and socially complex marine mammals. Entire pods are forced to the shallow waters by hunting boats, in a drive hunt similar to that in Taiji, Japan’s infamous killing cove. Following the stressful drive to shore, those pilot whales who do not beach have a gaff hook stabbed into their blowhole and are pulled ashore by rope. There, they are brutally slaughtered by the severing of their spinal cord. Some take up to 30 seconds to die, while others suffer for as long as four minutes. No member of a pod is spared, not even pregnant females or juveniles. In his letter, Sheen goes on to emphasize that in addition to the horrific cruelty of the grind, the sustainability of this mass killing of oceanic wildlife is uncertain at best. “The number of pilot whales in the North Atlantic is unknown. I would urge that Denmark invoke the precautionary principle and err on the side of conservation, considering that we simply do not know the status of pilot whale populations,” writes Sheen. 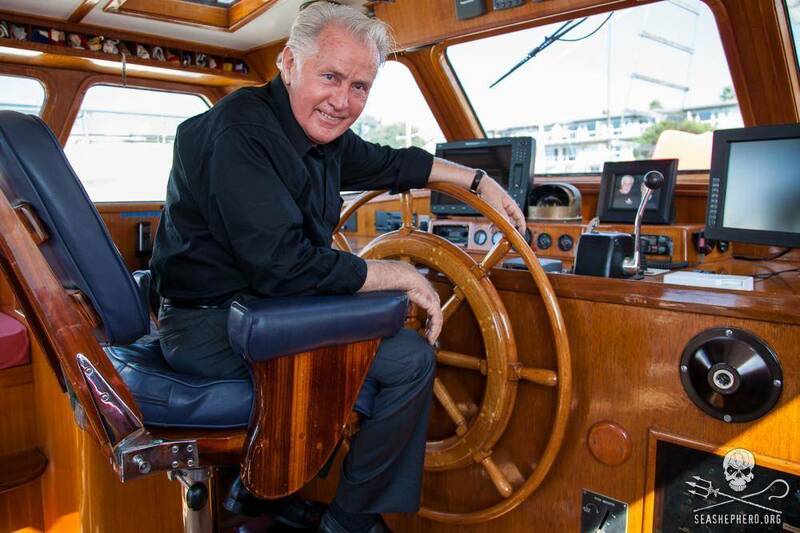 Martin Sheen is a longtime supporter of Sea Shepherd Conservation Society and friend of the organization’s founder, Captain Paul Watson. In 1995, Sheen joined Captain Watson on the ice floes of the Gulf of St. Lawrence to oppose the brutal Canadian seal hunt on the frontlines. 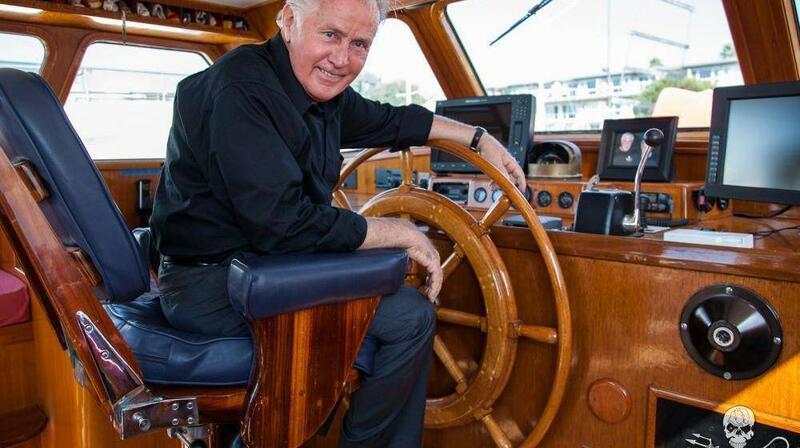 Sea Shepherd Conservation Society’s research sailing vessel R/V Martin Sheen, unveiled in late 2014, is named in the actor’s honor. The vessel is currently in Costa Rica for an ocean research and awareness campaign. I was appalled to see the Danish Navy being used to defend the killing of hundreds of defenseless pilot whales. Does it really take a frigate, a patrol boat, commando units and a helicopter along with Danish police officers and a Faroese patrol boat to stop a group of compassionate, non-violent people? Is the need to slaughter so many animals really so important to Denmark? The meat from these whales is contaminated with mercury. If it were pork or beef so highly contaminated with mercury, it would not be allowed to be sold, yet even children are eating this toxic meat. And to make things even more disgusting, I have seen children mutilating the carcasses of the whales right after the slaughter. Perhaps this is about oil. The exploration for oil in the waters around the Faroes could be one reason that Denmark is willing to tolerate this atrocity. Recently Denmark passed laws against kosher and halal methods of slaughter, citing cruelty to animals, and yet at the same time tolerating the cruelty in the Faroes. This smacks of discrimination based on an ethnic and cultural bias. The number of pilot whales in the North Atlantic is unknown. I would urge that Denmark invoke the precautionary principle and err on the side of conservation, considering that we simply do not know the status of pilot whale populations. I am surprised that a nation that has such a wonderful record of positive social and environmental policies would support an annual massacre of whales for which there is no subsistence need. Toxic meat, unknown numbers, inhumane slaughter, no necessity. The Grind simply does not make any logical sense. I would urge Denmark to not continue to support this slaughter of whales and to refrain from sending your warships to oppose non-violent people of compassion.